Are you a 20-something, or do you know some 20-somethings? If so my friend and blogger Renee Johnson (the Devotional Diva) has just written a book that you will want to tell them about. 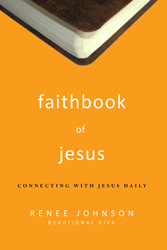 Faithbook of Jesus: Connecting with Jesus Daily is an amazing devotional, especially for those going through those crazy, confusing, and transformative years that looking back we call our twenties. Each devotional is only one page long and is packed with explanation of scripture, a prayer and that all important social aspect. You can go to the faithbookofJesus.com website and choose community to chat with others about the devotional you all just read. This is such an important aspect to this book that I think really adds to its uniqueness, and will contribute to its success. Adding the web-group aspect to the book is like creating instant home group for 20-somethings who need a place to talk about the things they are feeling, reading and going through. If you’ve got a 20-something in your life or perhaps a whole group of them, this book and its 317 devotionals are a great gift and resource for that 20-something in your life. What happens when a baby takes its first step? He or she stumbles and falls down, or looks for something to grab on to. Much like myself when I am learning how to walk in a new area of life; I am not very proficient. Starting something new takes a willingness to throw off whatever is hindering me. That could be a relationship that I know I’m not supposed to be in, choosing how to spend my time, or even the way I spend my money. Today is the day to throw off whatever is bothering you—frustrating thoughts, negative emotions, or unrealistic demands on your time — as it says in Hebrews. Take those thoughts, crumple them up like a wad of paper, and throw them away. Picture the wastebasket. Make the shot. Gone. (Prayer) Dear Jesus Who Makes All Things New, Thank you for looking at us as mature adults when we see ourselves as growing children. You know our limitations and you see us for who we will be — complete and whole. Help us to throw off whatever hinders us so that we can see ourselves as you see us. Amen. (Community) What’s your wastebasket story? I’d love to know how God helped you make the shot by throwing off whatever was hindering you from his best. Please visit http://www.faithbookofjesus.com and click on “Community” to share. What did I tell you? So get out there and order this book for all the 20-somethings in your life! And for more information, check out the faithbook website. If you catch this before 2:00pm CST today, then you should head on over to StoryUnfolding.com and catch the action. Ben Arment is doing a conference in October called Story and this is a promo event for that. The conference is all about how to communicate our stories better. As creatives we are story tellers, some of us with the pen or the brush, some with a song and some with photoshop and other digital tools.We can all tell our stories better. Watch today and see if it inspires you or helps you gain insight on how you can, more creatively, tell the story you are meant to tell. Making your living as a creative can be draining. Most of the time you are bringing someone else’s vision to fruition or a the least you are meeting their deadlines and have input other than your own. Its the equivalent of emptying your bottle of creative juice and never pouring anything back in. If you find that you fit this category of creative its a good idea to find an outlet, outside of what you create at work, that allows you to pour juice in your bottle instead of out. One way that I let loose creatively is baking. I really enjoy making cupcakes. I have an entire recipe book devoted to decorating cupcakes, and I love it! This goes way beyond simple batter in paper sleeve and some icing smeared on top. No no, this is art that you can eat! It’s so much fun to find new and interesting ways to create a cupcake. There is one recipe in my book I’m not brave enough to try yet, but one day I will. Its a sheet of cupcakes all tightly packed together and iced as one to look like Starry Night. Its practically a cupcake jigsaw puzzle. One day I’ll get brave enough and have enough time to attempt it, until then it’s just out there taunting me. So much of the art I create for a living is done on a computer that it feels good to actually create with my hands not wrapped around a mouse. Part of staying healthy as a creative is feeding your creativity. Find something that thrills you, that peaks your creative interest and carve out the time to do it. It may seem like wasted time but you will be surprised how much more productive you are at work when you are creating out of the overflow of your creative juice bottle rather than spending the last few drops. Do you spend time filling your creative juice bottle? If so, what things do you do. If not, why? I had such a great time at Echo. I love getting to talk with and be around creative people. The creatives are such an amazing community and I am glad I get to be a part of it. I know how hard it can be to accomplish your vision when you don’t have the tools and resources you need to make it happen, that’s what inspired me to come up with the class for Echo. Thanks so much to everyone who showed up for the session. I hope you think it was time well spent. Just in case you missed it or there is something you want to go back here is the session text and the slides along with the resources list that has been posted previously. Let me know what you thought of the class and if you have something to add share it with the class. We are all in this together and we are better together than alone. Wow, Echo has been so great this year. It has exceeded last year and makes me look forward to next year even more. Rob Thomas and his team (Kami, Scott, Jenny, Ashley….) have done an amazing job. Thanks to everyone who came to my session yesterday. I had a blast hanging out with you all and I hope you found it worth your time. If you have questions or comments I would love to hear them. You can contact me at tiffani@istockphoto.com or on twitter @tiffanibarnes. I love helping the local church, and the people who staff it, do what they do better. Here is the Shoestring Resources List from my session at the Echo Church Media Conference. This is in no way a complete list. If you have something to add leave a comment and share it with the group. Lets all learn together! Day one is about half way over. It’s been a great day so far and I’m looking forward to Phil Visher tonight. However, the best part has been getting to see friends that I only get to see at events like this. Being a creative, especially in a small-medium church often means that you are going it alone. Conferences like this are a great chance to network with other creatives and gain new insights and knowledge so that you can walk away and do your job better than before. But beyond that this is a great chance to recharge and get some perspective. You pour out your creativeness all the time and it’s important that you do some things to refill your tank. If this is you and you want some conference suggestions contact me and I can give you some ideas, after all, I do go to conferences for a living. My session is tomorrow at 4pm, we’ll see how it goes.